The A B Cs of Site Selection is about helping you succeed. It provides you with the tools you need to make smart location decisionsthe kind that will enable you to consistently pick home run locations for your retail or restaurant business. Readers will especially benefit from learning about the importance of the Six Keys and why using a Site Selection Scorecard is highly recommended. Site selec… tion is neither an art nor a science. Rather, it is a combination of both. It is a process which involves doing homework. In the long run doing homework is the only way to justify making what will surely turn out to be amajor financial investment. 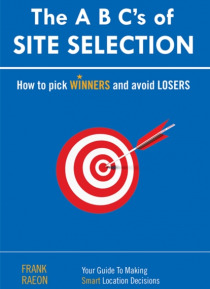 If you want to succeed it is absolutely imperative that you understand that siteselection is all about employing a systematic and disciplined approachone which is intended to minimize mistakes and maximize opportunities.